Getting and managing real estate leads today is more important than ever. Customer relationship management (CRM) is mandatory if you want to beat the competition. Staying in contact with prospects and clients and servicing their needs has to be database driven. 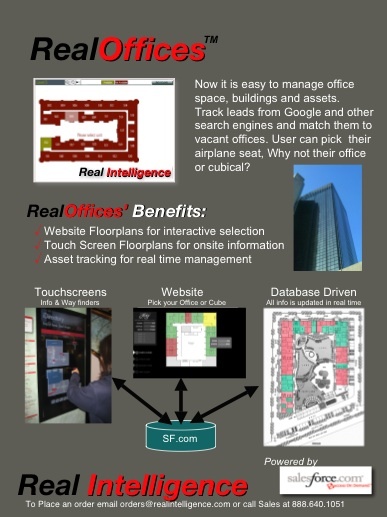 Real Intelligence products have been deployed and delivered impressive results at many customers, including Coldwell Banker, Alain Pinel, Intero, Geneva and many others. Our applications are built on top of the #1 CRM tool Salesforce.com. This powerful environment is second to none. Our applications are unique in that they can be used with existing Salesforce.com licenses or they can be purchased directly from Real Intelligence. 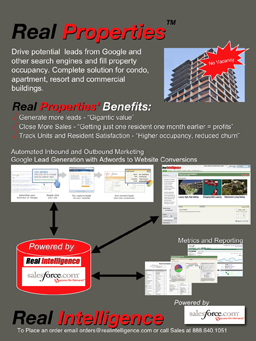 Generate more leads, close more sales, track units and residents. 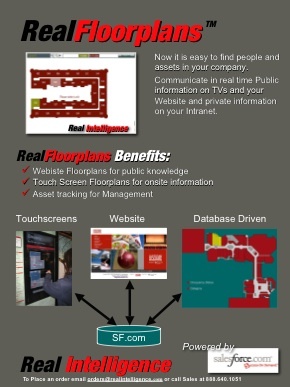 Interactive floor plans to assist in selling condos or managing conference room and rental reservations. Track office assets and people. Reserve conference rooms.